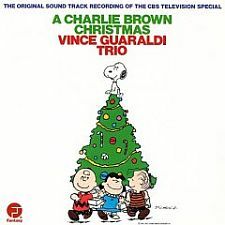 If you have not done so yet, head on over to eMusic and download Vince Guaraldi’s classic score for the 1965 Peanuts TV special A Charlie Brown Christmas. Nostalgia inducing holiday instrumental jazz at it’s best, this CBS soundtrack is as familiar as the cartoon itself. + Vince Guaraldi’s A Charlie Brown Christmas available through eMusic’s 25 Free MP3 trial offer. + Visit The Hype Machine for additional Christmas MP3s. I totally agree! I love this movie & all of the Charlie Brown holiday movies!!! Thank you! It’s definitely not Christmas without Charlie Brown and the gang! The first few notes really take me back to when I was little. yes! i still have the record from when i was little. the gatefold has a picture book insert with the story from the tv special in it. unlike my he-man records, it still gets a spin once a year. Frieda: I can’t go on, there’s too much dust. It’s taking the curl out of my naturally curly hair. Charlie Brown: Don’t think of it as dust. Think of it as maybe the soil of some great past civilization. Maybe the soil of ancient Babylon. It staggers the imagination. He may be carrying soil that was trod upon by Solomon, or even Nebuchudnezzar. Pig-Pen: Sort of makes you want to treat me with more respect, doesn’t it? Frieda: You’re an absolute mess. Just look at yourself. Pig-Pen: [looks at himself in Frieda’s mirror and smiles] On the contrary, I didn’t think I looked THAT good.